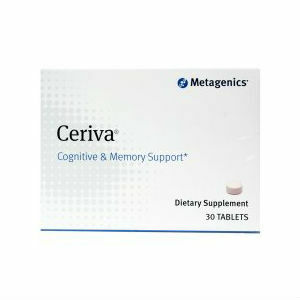 The purpose of this review is to analyze a supplement called Ceriva, manufactured by Metagenics. The producer says that this dietary supplement acts like a neuro-protective as it enhances the metabolism and promotes healthy brain function, better memory and cognition. The product increases neurological health and supports the natural production of healthy antioxidants. If you want to learn our opinion about this remedy and how or if it works, keep on reading. It is highly important that customers take note of the fact that this product contains milk, therefore it is not recommended for people with dietary restrictions (vegetarians or vegans), especially for those who are lactose intolerant. On the other hand, the supplement is gluten free. This product should be taken as a dietary supplement once a day. The label advises customers to take one capsule daily, preferably in the morning. For best results, the capsule should be taken during a meal. The manufacturer states that some of the side effects may include fatigue, dizziness, sleep disturbances, mood changes or temporary anxiety. The remedy is strongly not recommended for being used at the same time as other prescription drugs or by people who already suffer from malabsorption syndrome, inflammatory bowel disease, peptic ulcer, chronic respiratory condition, asthma, benign prostatic hypertrophy, cardiac arrhythmia or a seizure disorder. One container of Ceriva has 30 tablets and costs $39.95. Sadly, no other discounts or monthly subscriptions are available. When compared with other similar products, Ceriva turns out to be quite expensive, especially given the fact that the producers don’t offer discounts or even package or best value deals. This is definitely a disadvantage when it comes to people who wish to frequently use this remedy. The fact that this dietary supplement does not come with any type of guarantee is by far its biggest disadvantage. The producers give no information about return and refund policies. This is, of course, incredibly concerning and is an indicator of the fact that the manufacturer does not trust his product to be an effective one. More than that, it seems that not even the customers trust it, if we take into account the fact that there are no product reviews on the official website of the manufacturer. All in all, Ceriva is an all-natural product that has an effective concentration of ingredients that have also been proven effective in clinical trials. However, one of the main drawbacks of this dietary supplement is the quite impressive list of possible side effects. Add that to the lack of guarantee, of customer reviews and of discounts and you might want to reconsider buying this remedy. Henry Costa	reviewed Metagenics Ceriva	on November 15th	 and gave it a rating of 2.5.